I made my first set of products for my Etsy shop today. I feel really excited and pleased with my work, especially as I went against my better judgement and tried something completely new to me. 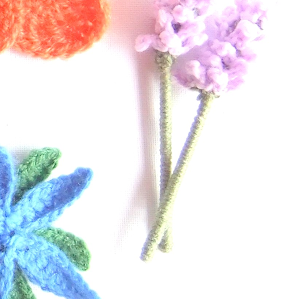 ; felt brooches. 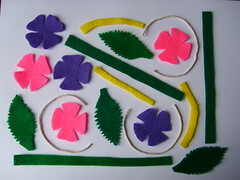 I got the basic design from Victoria Brown's Felt Crafts (Craft Workshop) but the smaller variations I made up myself. I found the project very fiddly and time-consuming but I think the end product is pretty and the intricate detail makes all the difference in my opinion. I really like the felt brooch as it has so much potential for variation. 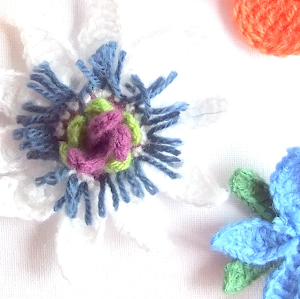 I am happy to receive requests for individualised items on Etsy and I think by changing the colours, number of flowers, leaves and stems, and even the flower shape (as in poppies or roses or daffodils) this item could be really effective. I used 5 colours of felt; emerald, forest green, yellow, shocking pink and purple, as well as thread, a brooch back and some string to make the brooch. The tools I needed were a pencil, tracing paper, pins, scissors and a needle. If you would like to buy any of these items please click here. 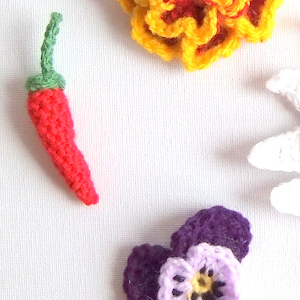 Also if you would like to order an individualised version of the felt brooch designs please click here to make your request. What do you think about the brooches? Good or bad I would like your feedback, so please comment below.